Athletes enter events like the FIFA World Cup or the Baseball World Cup to compete for glory. I entered a different type of cup in Parramatta called Cup and Plate Cafe restaurant for a different kind of glory. 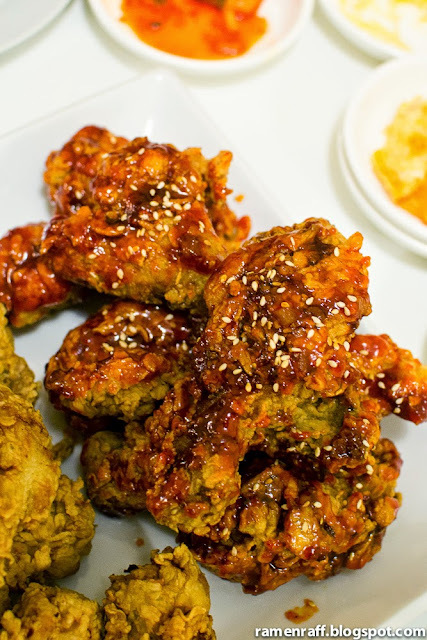 The Korean Fried Chicken kind! There were only a few places where you can get legit Korean Fried Chicken. 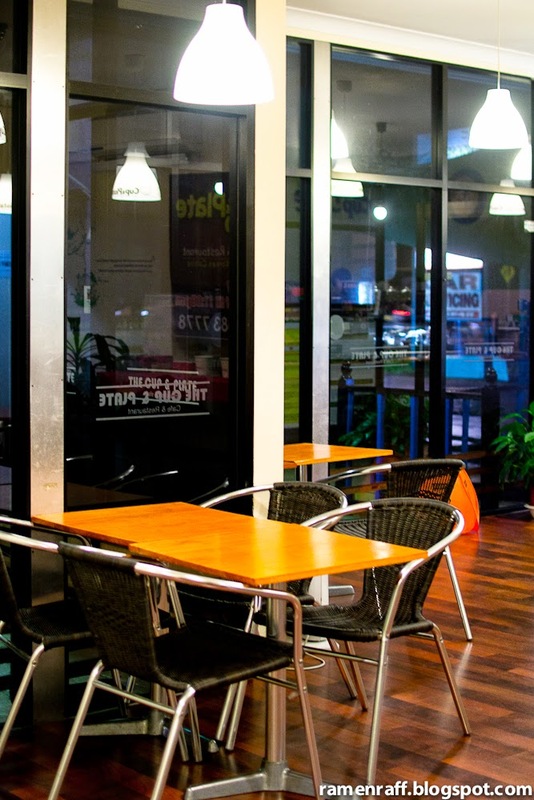 Areas like Strathfield, Sydney CBD and Eastwood. 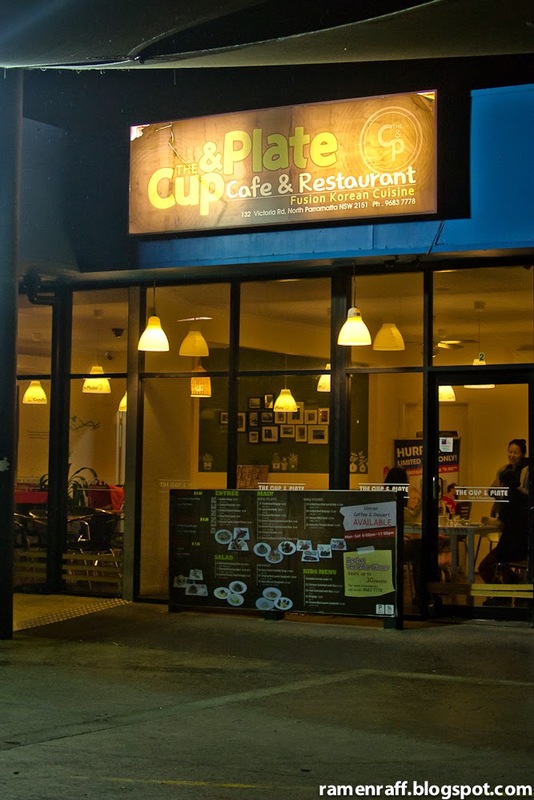 Now, Cup and Plate Cafe of North Parramatta (right next to Zip Carwash) has joined the line up with Korean/Fusion dishes on offer and 7 types of fried chicken available from 6pm. The only thing left for me to do was to check them out. First up, we tried their soy beef ribs stew ($16). 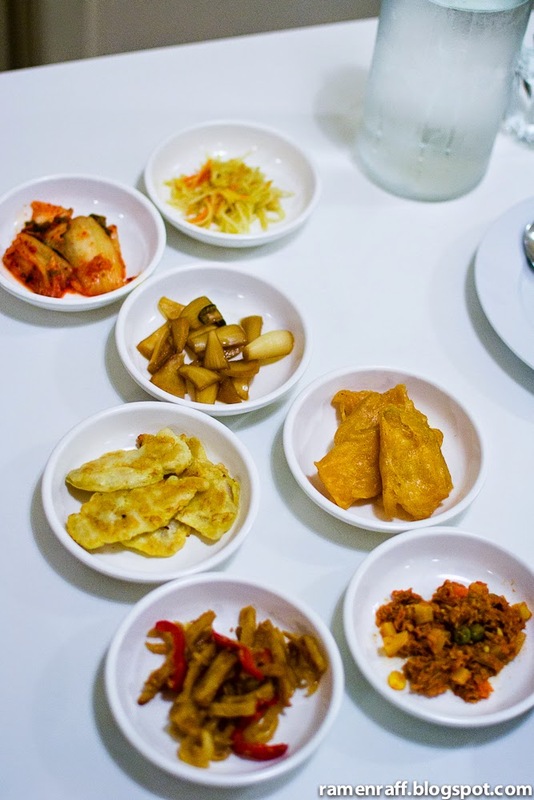 Along with it came one serving of rice and 7 types of banchan. The sweet potato scallops was my favourite with its crisped batter and soft sweet innards. 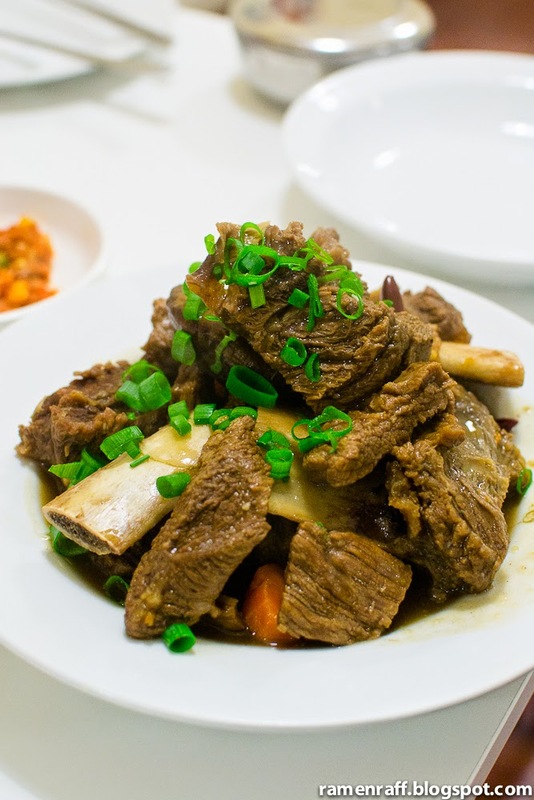 The tender beef comes with potato, carrots, mushroom and date with a light sweet soy braising sauce. Their fried chicken is the main reason for this visit. 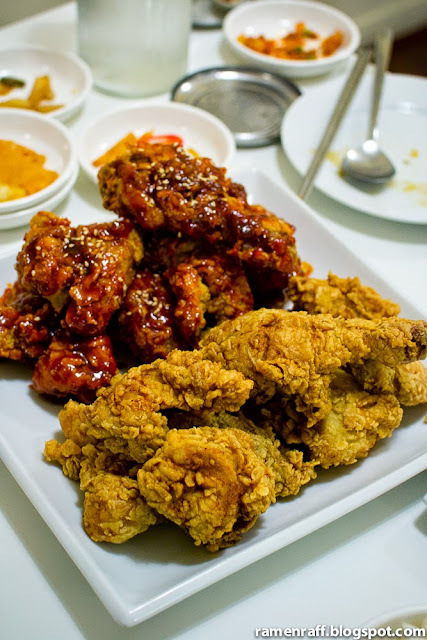 We opted for a platter of half of the original and half of the sweet chilli fried chicken ($30 including sides of pickled daikon and cabbage salad). I started with the original to see if it passes the crunch and taste test. Well, it certainly did! 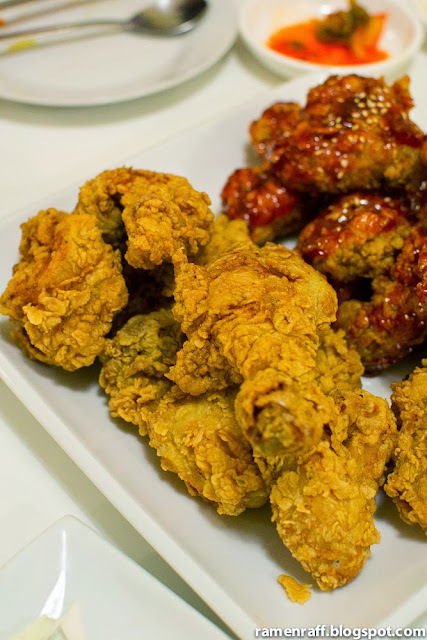 The coating definitely packed some crunch but the texture was a little bit lighter compared to Naruone's original fried chicken coating. The meat was juicy and I could taste notes of ginger, onion and garlic. It was definitely delicious. 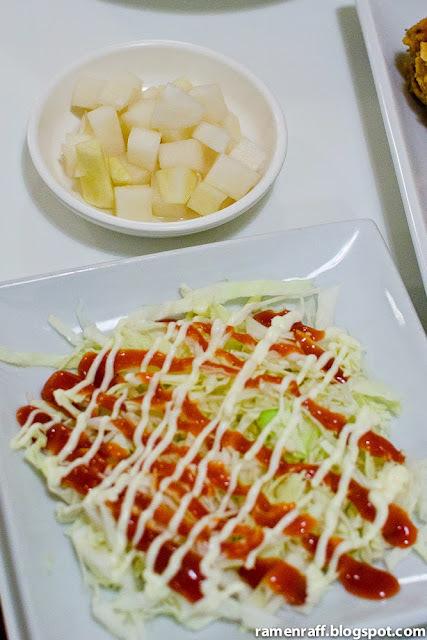 The sweet spicy was my favourite between the two. The coating still retained its crunchy awesomeness inspite of being glazed with a sweet spicy sauce. The sauce was sticky and it had a sweet tangy flavour with a tiny bit of heat. I would definitely come back for more of this! 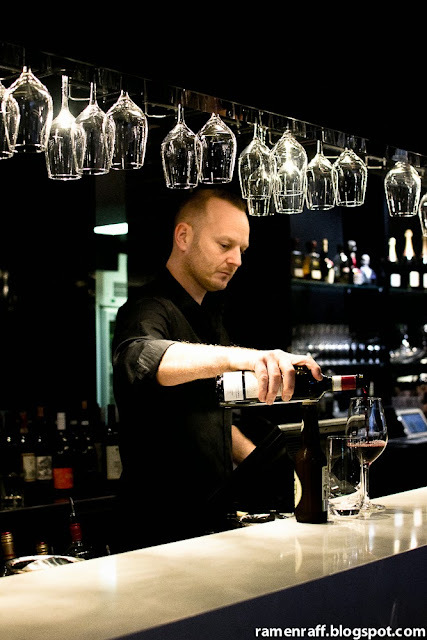 Sydney gets the whole bar restaurant scene spot on. We are so lucky to have easy access to high quality produce and extensive choices of local wine. 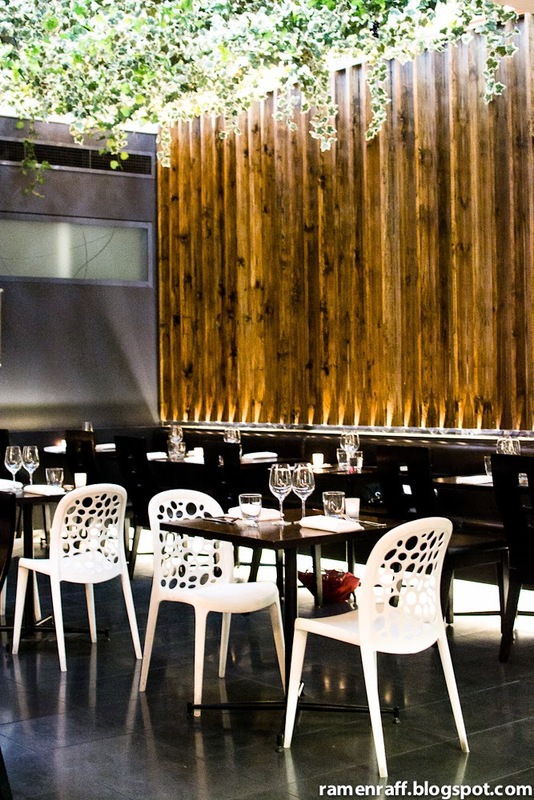 Just over 6 kilometres drive north of Sydney CBD is a new Mediterranean inspired modern Australian restaurant. 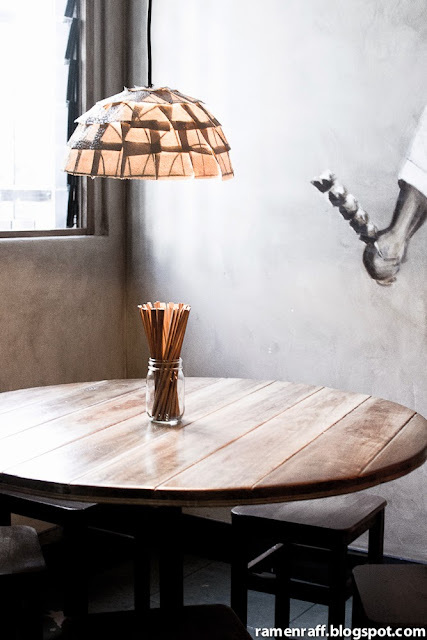 Barrel bar and dining is located on Military Road in Cremorne. Owners Stephen Thompson and Tony Binning along with Chefs Zan Stanning and Luke Davenport runs the show. They are all about showcasing high quality local produce to be matched with wines sourced from local and international producers. 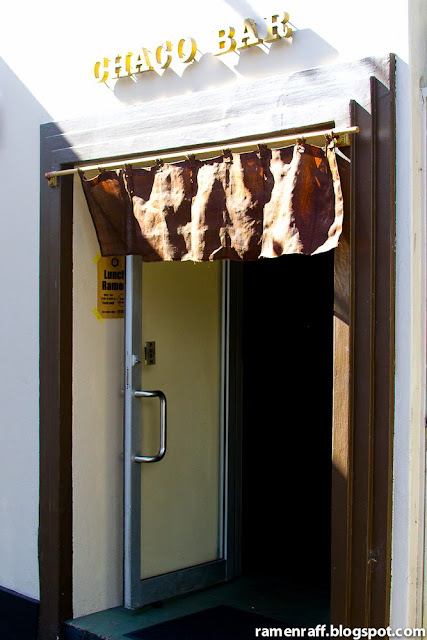 Upon entering the premises, a mixture of modern Manhattan bar and Scandinavian fit out is revealed. 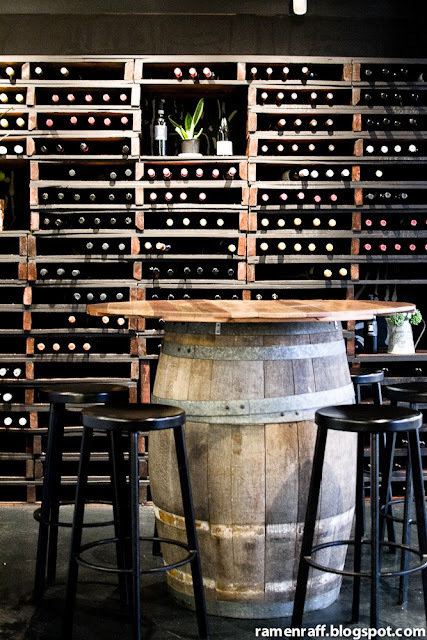 An impressive display of wines and bar seatings can be seen in front, and an elegant courtyard-like restaurant setting at the back is available. Their cocktail list looked very interesting so I decided to try the War Head ($18). 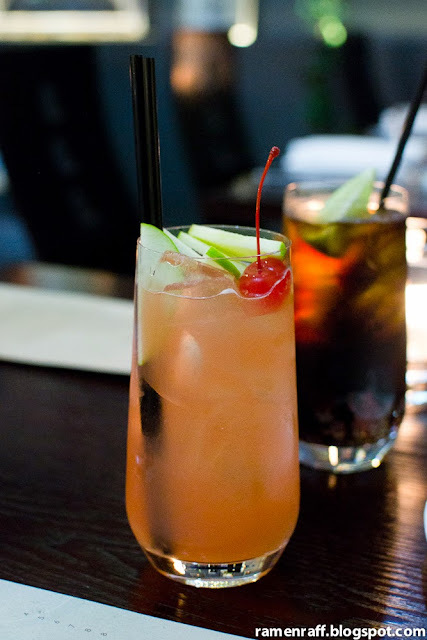 It was a mixture of apple sours, maraschino cherry, vodka, muddled lime, and apple juice. After my first sip, the drink's name made a lot of sense. It was an explosion of vibrant sweet fruity flavours! 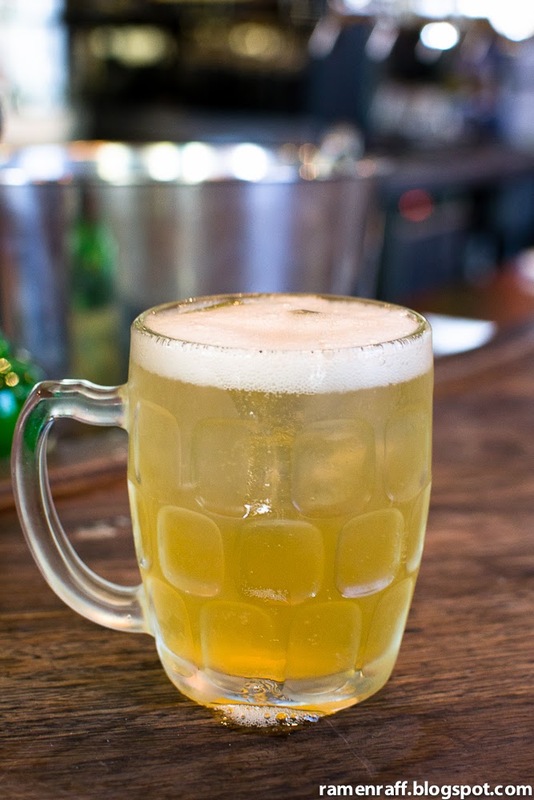 The lime and vodka cuts through the sweetness. I enjoyed the War Head and recommend it for those who like cocktails with a mild alcohol after taste. First dish we tried was a 12 hour cured Queensland king prawns, vanilla and coffee bean jelly, lemon, thyme, coriander, pine nuts ($17). It had the effect of a prosciutto and a tad on the salty side. But the lemon, vanilla and coffee bean jelly, and pine nuts balanced out the flavour. 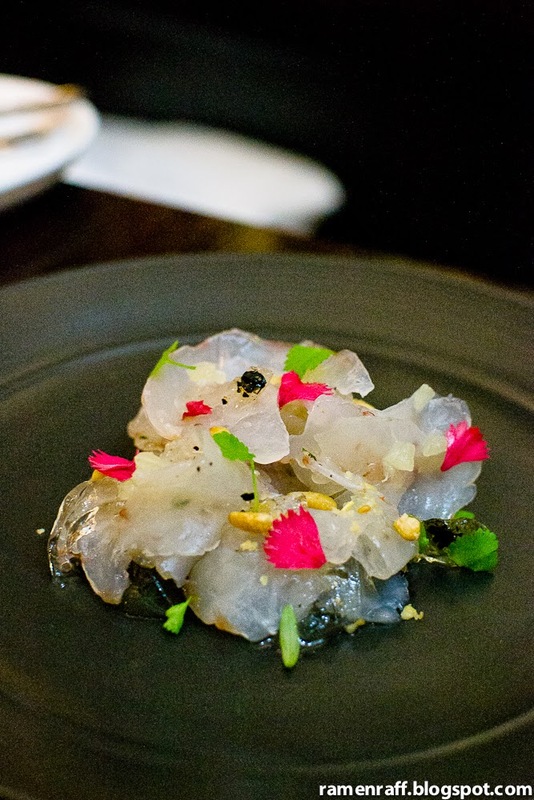 The pine nuts in particular added a sweet buttery flavour that goes well with the cured prawns. The pressed pork belly, poached Victorian pears, pickled fennel, red vein sorrel, roast macadamia nuts ($19) was another delicious dish. 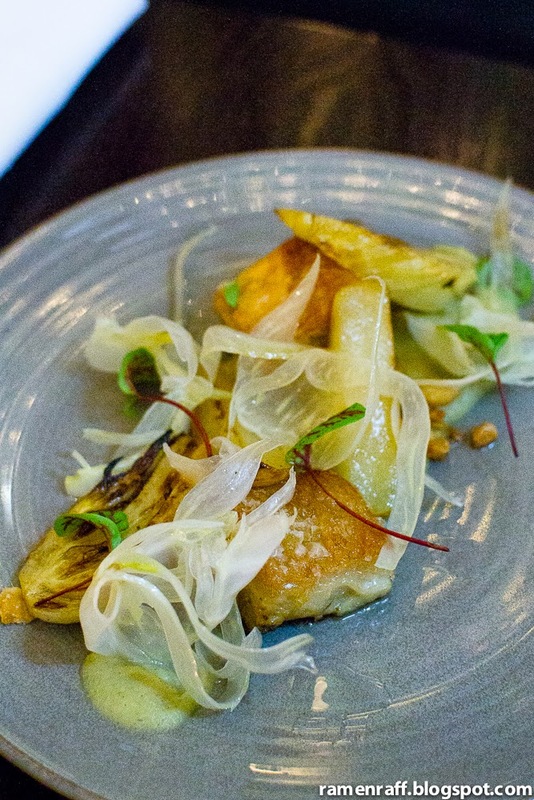 The pickled fennel added a nice flavour accent to the pork belly. The chunky cubes of pork had a caremelised crust and was tender on the inside. The poached pears beautifully complimented the pork. 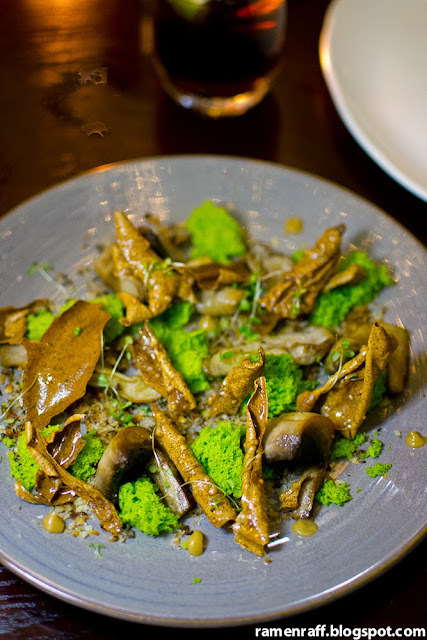 Their sautéed king oyster mushrooms, lemon garlic puree, parsley sponge, juniper berry powder, mushroom bark, mushroom pangratatto ($14) is one of the best mushroom dishes I've had (possibly the best to date). It was creatively plated like a mini forest. The smoky crackling-like mushroom barks, the buttery silky oyster mushroom and the garlicky mushroom bread crumbs (pangratatto), lemon garlic puree and parsley sponge was a cocktail of textures and flavours that worked so well. 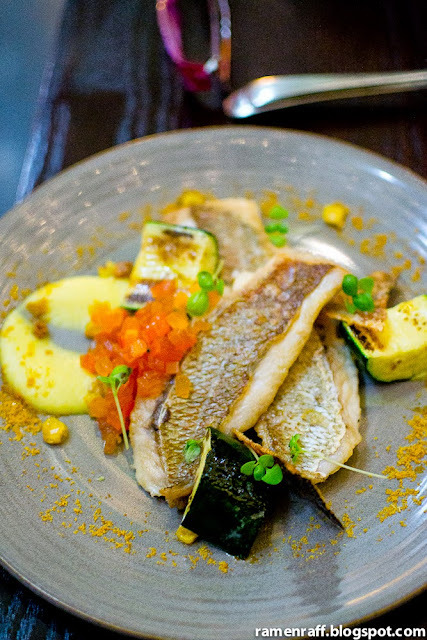 We also had their local snapper, persimmon, charred zucchini, yellow squash puree, crisp corn kernels, lemon & garlic ($31). The snapper was perfectly cooked along with a nice wafer-like crisped skin. The sweetness from the squash puree and crisped corn kernels went well with the snapper. It's one of the most enjoyable seafood dishes that I've had in a while. 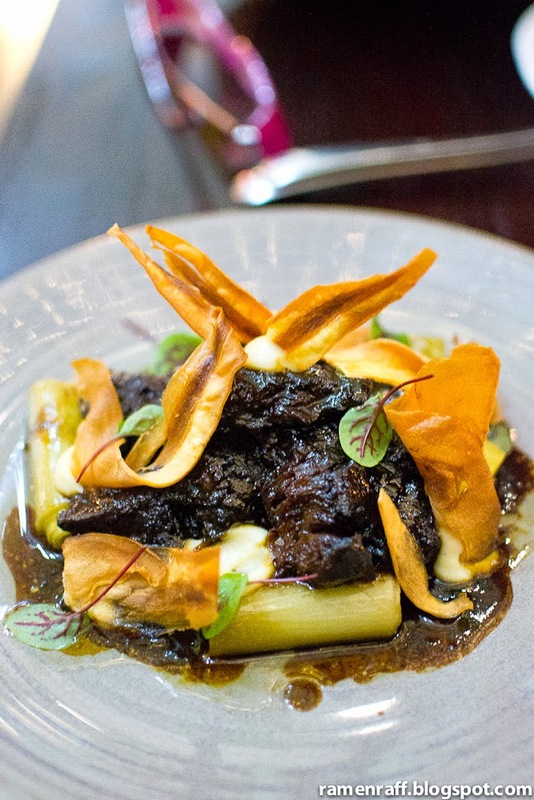 The slow cooked beef cheeks, confit leek, turnip, pureed parsnip, braising sauce ($26) was the stand out dish for me. The beef was juicy and tender that it took very little effort to pull it apart. I also enjoyed the caremelised glaze around it. The soft and sweet confit was such a fitting side to the beef along with the creamy pureed parnship and turnip. For dessert we had a frozen dark chocolate parfait with chocolate shards, strawberry powder and sweet lime gel ($14). The frozen dark chocolate parfait was like a light malt chocolate ice cream and I totally digged it! 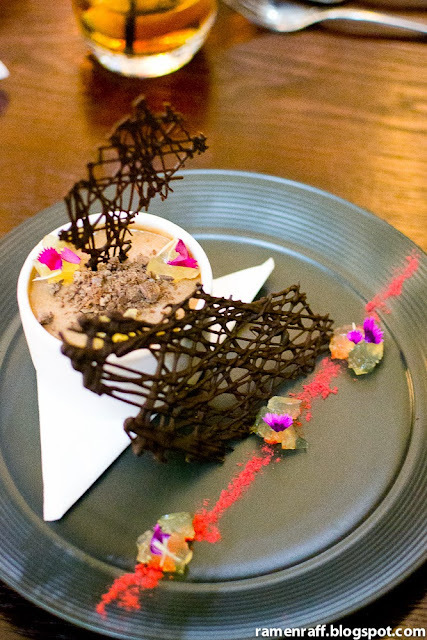 The chocolate shards added an enjoyable contrast to the parfait. The strawberry powder and sweet lime gel acted as the fruity accent to cut through the full body chocolate flavour. Barrel Bar and Dining is an amazing addition to the Lower North Shore food and bar scene. Their funky creative twists to classic dishes were superb and the service is excellent. 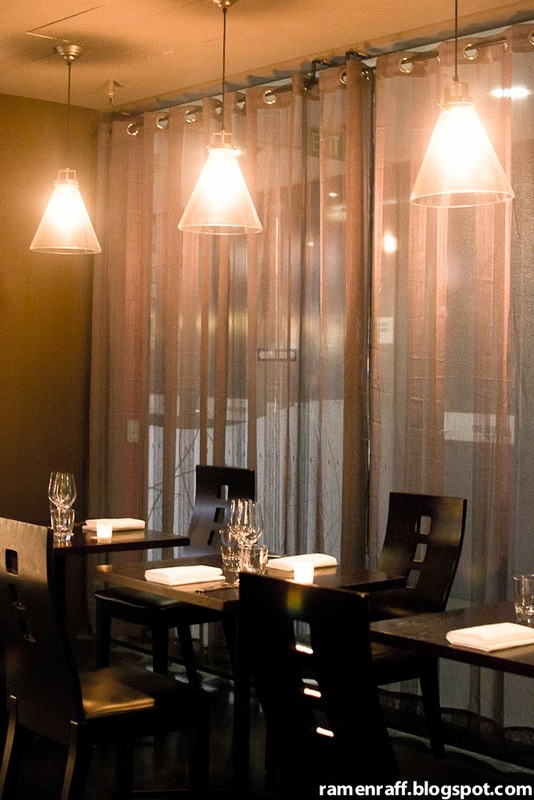 Ramen Raff was invited by Drysdale Communications as a guest of Barrel Bar and Dining. 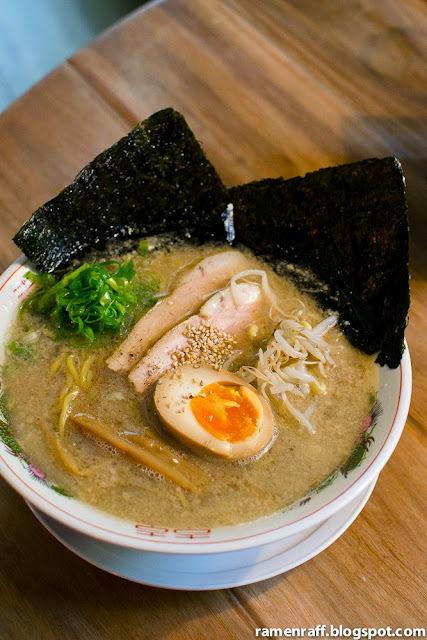 Sydney is spoilt with the amount of ramen choices available right now. 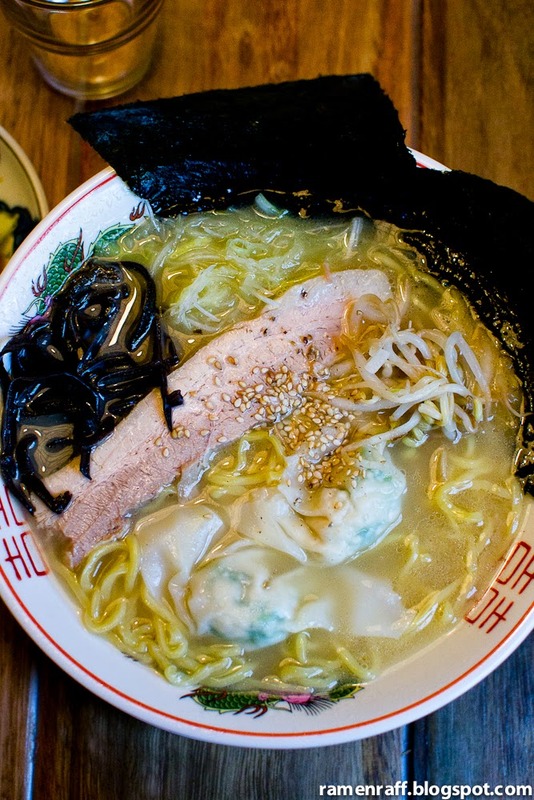 For most of us noodle soup aficionados, that's an absolute amazing thing! Just like the on-going burger craze, we can't get enough of ramen in this town! 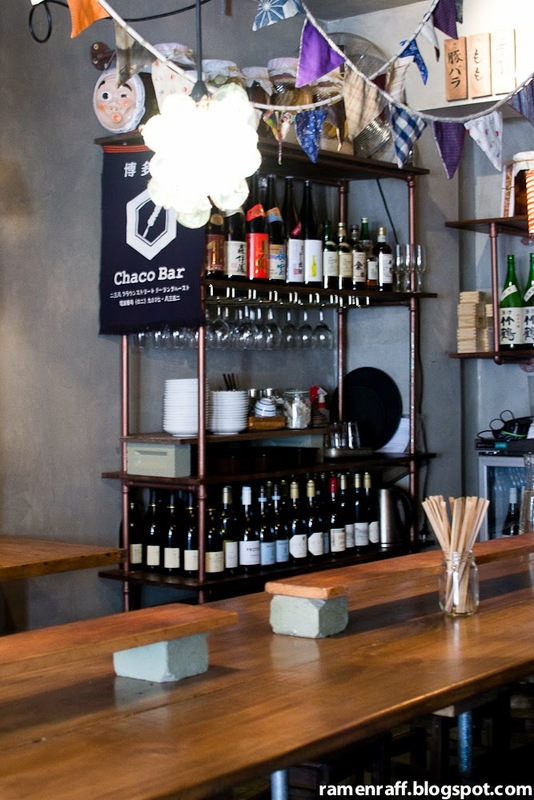 Just earlier today, the up and rising star Chaco Bar started offering lunchtime ramen. 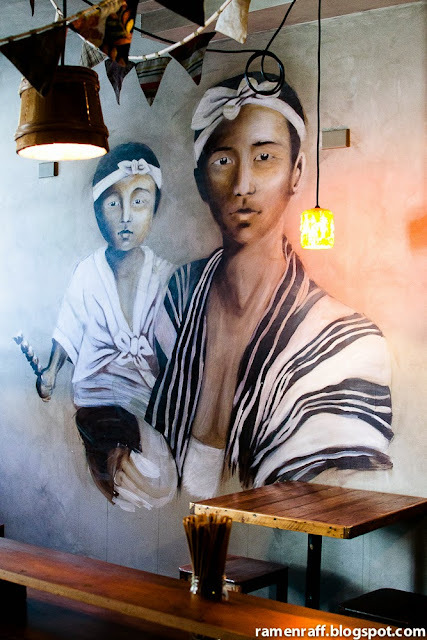 Chaco on Crown Street, Darlinghurst is normally a yakitori bar by night but from Wednesday to Saturday, they turn into a ramen bar for lunch with limited 30 ramen bowls. 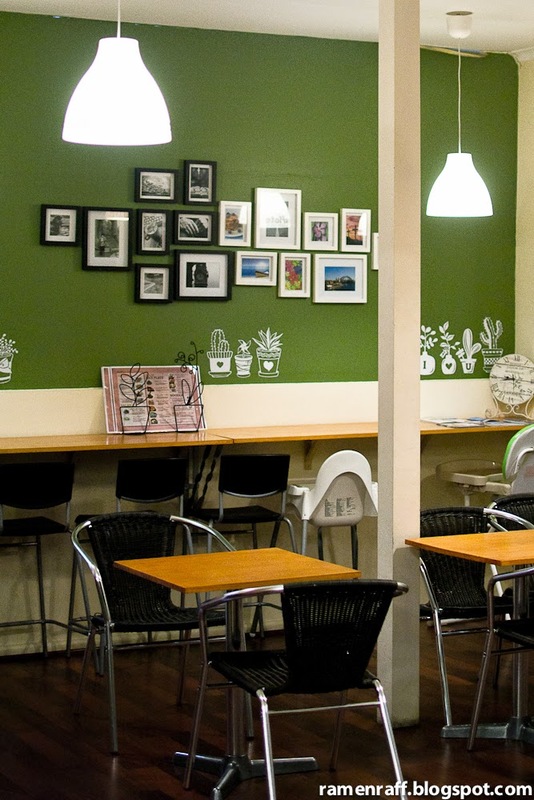 Where there's new ramen, you'll normally find me there! I also bumped into my homie Adrian Leonard. I really digged Chaco's whole Japanese-style mini tavern fit out. 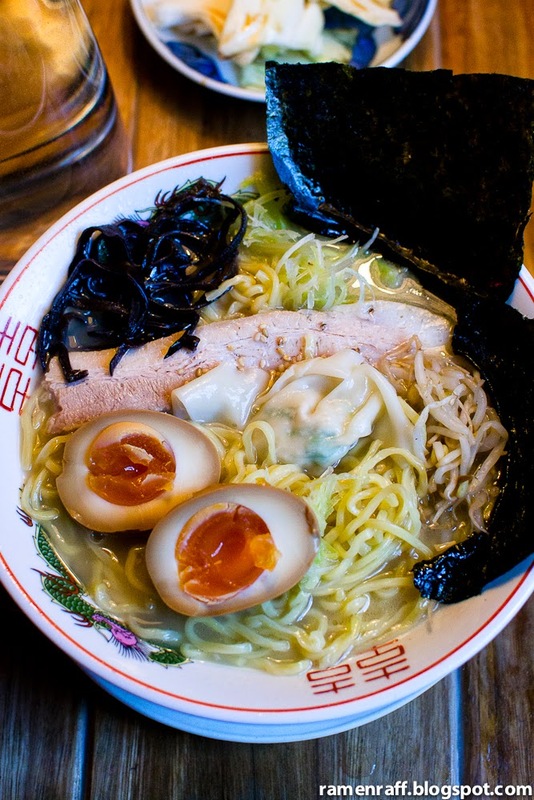 Regardless of how much I loved the space, my mission was to try Chef Keita Abe's ramen. Ready? Here we go! They have two ramen options. Adrian opted for their Fat Soy ramen ($13). 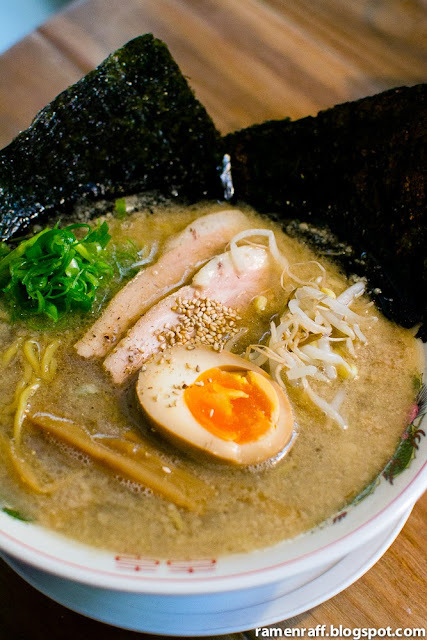 It consists of ramen noodles, cha shu, half ajitsuke tamago (flavoured soft boiled egg), nori, bean sprouts and shallots. I was only able to try the broth. It was more of light soy based broth with some form of pork fat to give more depth of flavour. There's almost a balance in both flavours but the soy component was more pronounced than the pork. I ordered the Fish Salt ramen ($13) because I was interested to try how the fish flavour will affect the chicken based broth. This ramen had noodles, cha shu, prawn & John Dory wonton, bean sprouts, nori & leek. The broth was amazing! It was similar to Ikkyu's paitan broth but with added fish flavour. Both chicken and fish flavours were nicely balanced and seasoned well. It was light but flavoursome. The noodles were springy and perfectly cooked. The wonton was like a good supporting act to the ramen's seafood theme. The tender fatty strand of cha shu in this ramen complimented the chicken component of the broth. The sweet mild onion-like flavour of the leek went well with the broth. I ordered extra ajitsuke tamago ($3) because to me, not having egg in a ramen is like a cheeseburger with no cheese. The egg was slightly sweet and the yolk was soft. 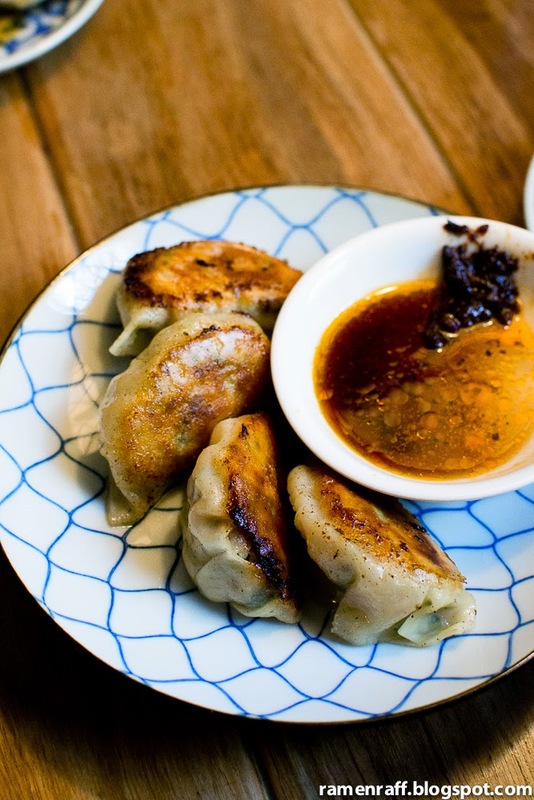 Gyozas (4 pieces for $8) are a ramen's best friend. It was perfectly cooked with the nice caramelised fried crust and the perfect marriage of pork and ginger. I really enjoyed their fish salt ramen and would definitely return to try their cha shu rice ball ($5) and onigiri ($5). Chaco Bar has won my ramen lovin' heart! So check them out! 12:00pm to 3:00pm (limited to 30 bowls a day). A Melbourne trip is not complete without burger joint visits. 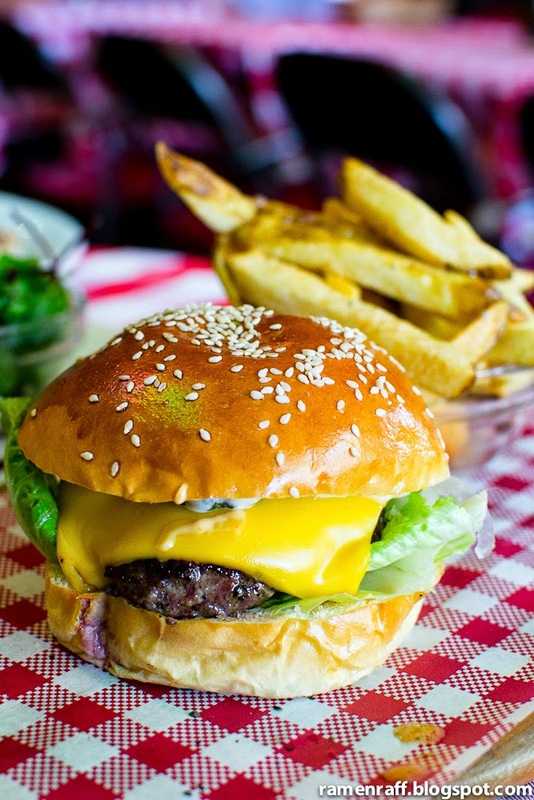 There are numerous places in Melbourne for excellent burger fixes and it truly is the burger Mecca of the Southern Hemisphere. 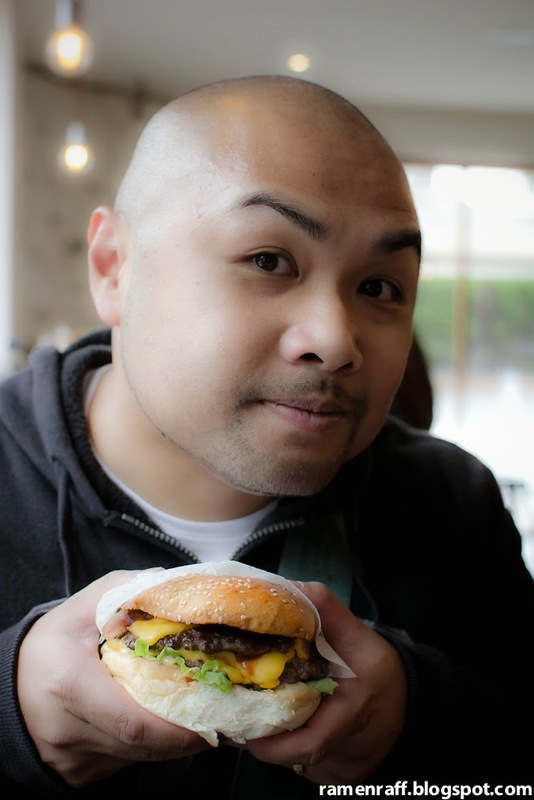 As I only had limited time during my last visit, I had to narrow down the list to a few burger places to visit. 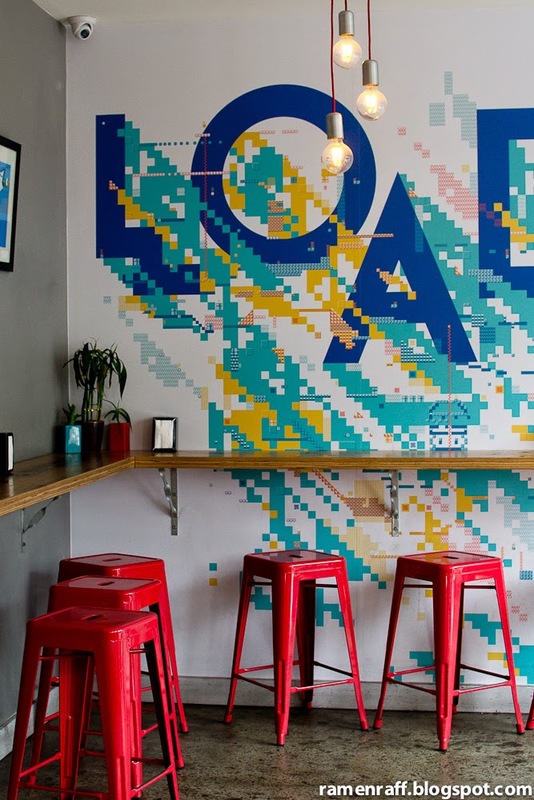 I decided to hit two Melbourne burger joint favourites and two new players in the game. 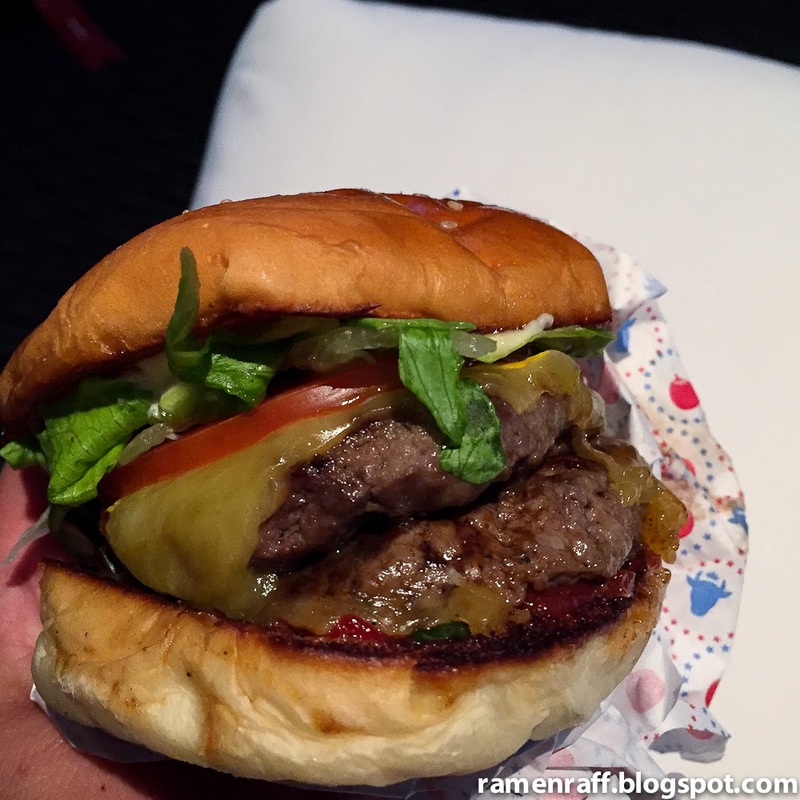 So here's part 2 of my "Burgers of Melbourne" and some more! 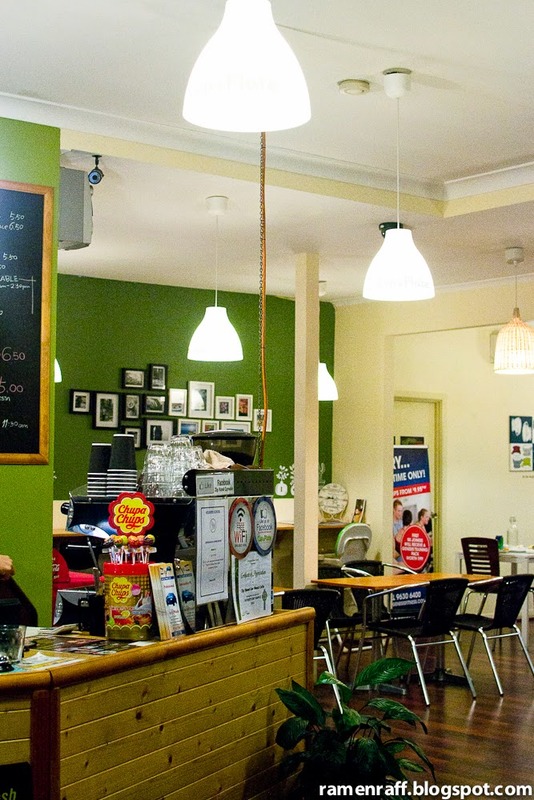 We saw the rise of this Footscray establishment around early 2014. 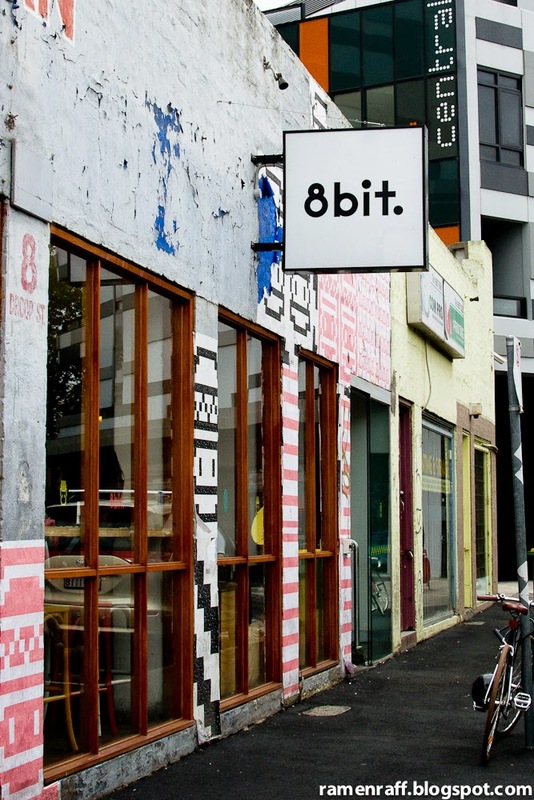 Burger aficionados raved about their burgers and so I made sure that 8Bit was my first place to hit up. 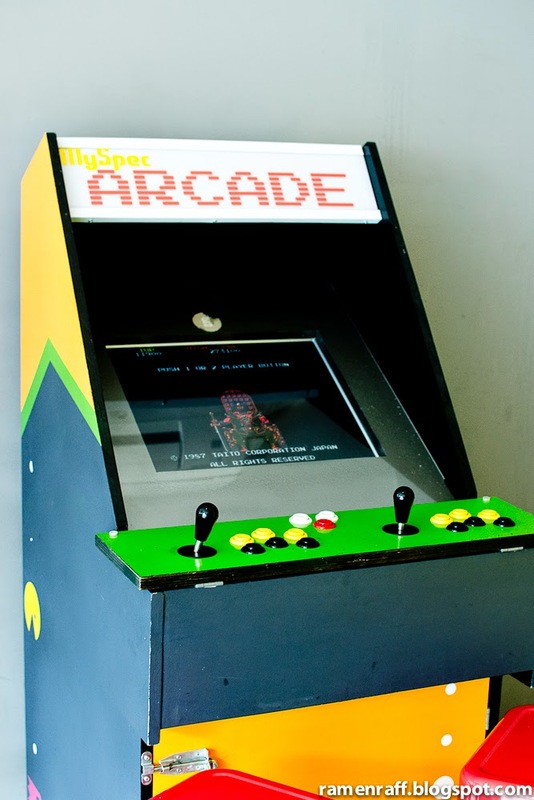 It's a burger joint themed around games that ran on retro gaming systems like Nintendo Entertainment System, Sega mega system games and its successor, the Megadrive. Seeing burgers named after my favourite games like Golden Axe and Double Dragon was so nostalgic. The beer battered chips ($4.00 for large) were perfect! It was crisped on the outside, fluffy on the inside and nicely seasoned. 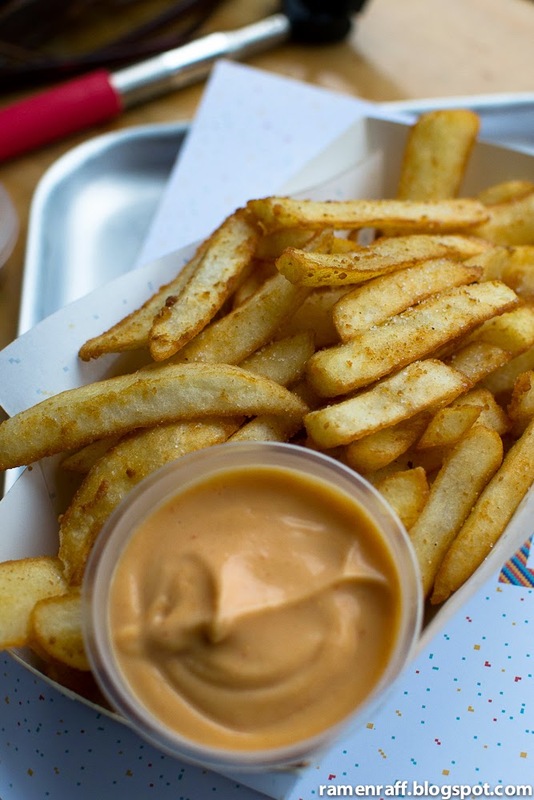 It is excellent on its own but I love dipping them on mayo especially if it's Sriracha mayo and smoky chipotle mayo! The burger that blew my mind from the get-go was the double patty Altered Beast burger ($9.50 and $3 for extra patty). It was a two-handed burger with beef patty, grilled onions, bacon, melted cheese and lettuce. The smashed-patties were perfect as it was juicy, well seasoned and it had that nice caramelised crust for extra meaty flavour. I don't normally go for burgers with BBQ sauce but the mixture of the 8bit sauce and BBQ intrigued me. The sauce mixture was phenomenal! It went perfectly with the smoky bacon and the grilled onions added sweetness to the burger. The whole burger handles well too! 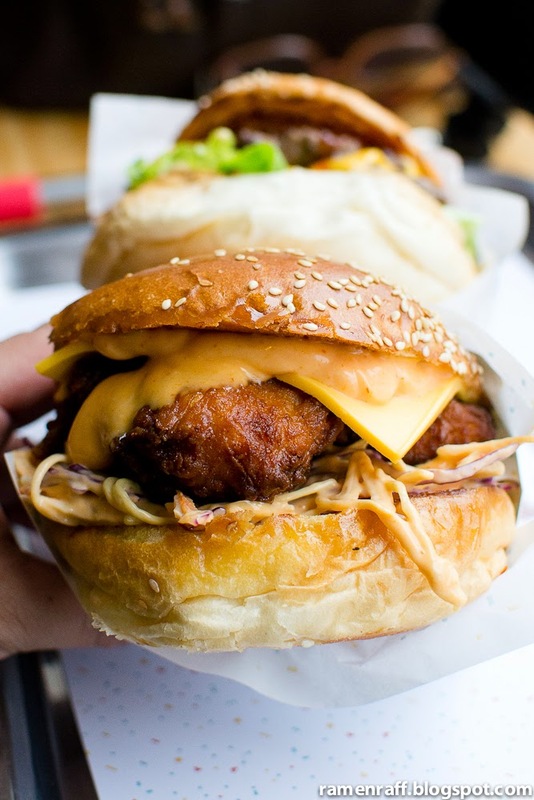 Their Golden Axe burger ($9.50) is a fried chicken burger with cheese, Sriracha mayo and slaw in a milk bun. It takes a lot for a chicken burger to impress me and this one totally hit the spot! The southern-style fried chicken coating had a texture in between crisp and crunch whilst having a very juicy flavoursome meat. The Sriracha mayo added some punch to the entire flavour. The cheese was nicely melted and the slaw was a perfect component to balance out the burger. 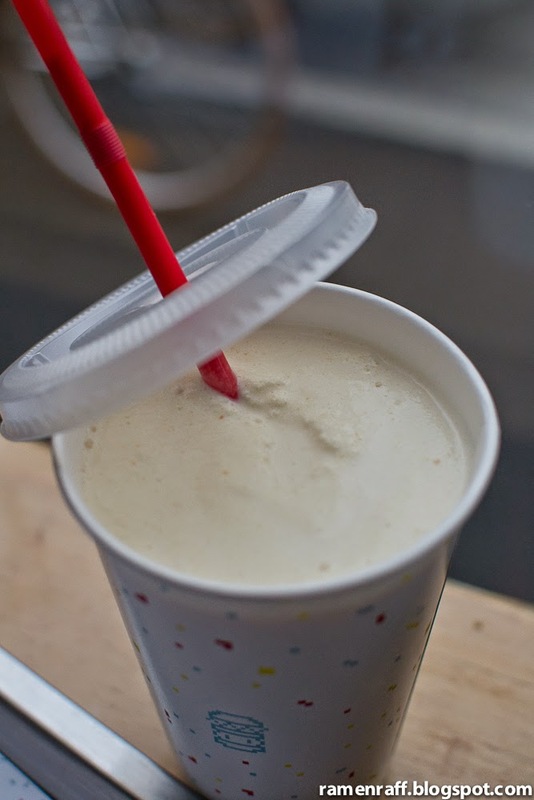 To finish things up, I had their peanut butter milkshake ($6.50). It was light and it tasted like a liquified "Picnic" chocolate bar! Although peanut butter was the main flavour, I could taste a bit of chocolate and caramel. Rather than just going for the usual suspects, I decided to check out a new joint that's only opened just around two months ago called Arbory. 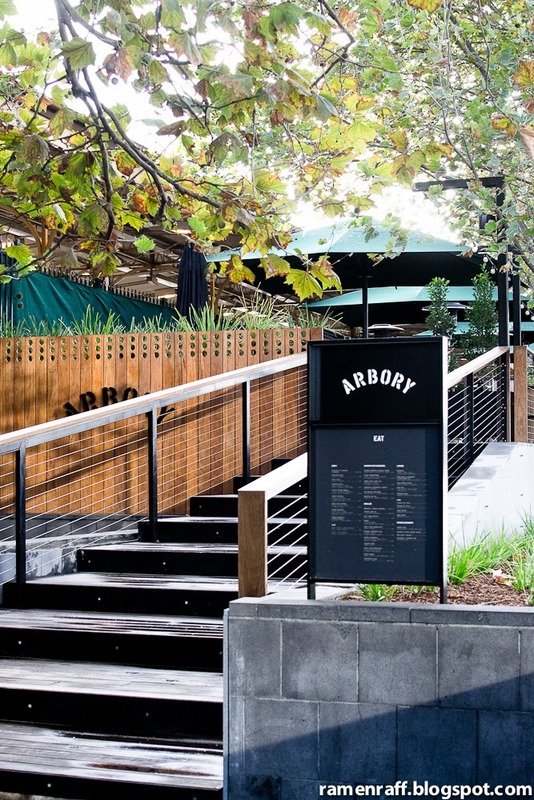 Besides being new, there were two other reasons why I was so keen to visit Arbory: 1) It's a bar restaurant built on a wharf where you have an amazing scenic view of the Yarra river and Southbank area of Melbourne. 2) Word is that they do an amazing cheeseburger. 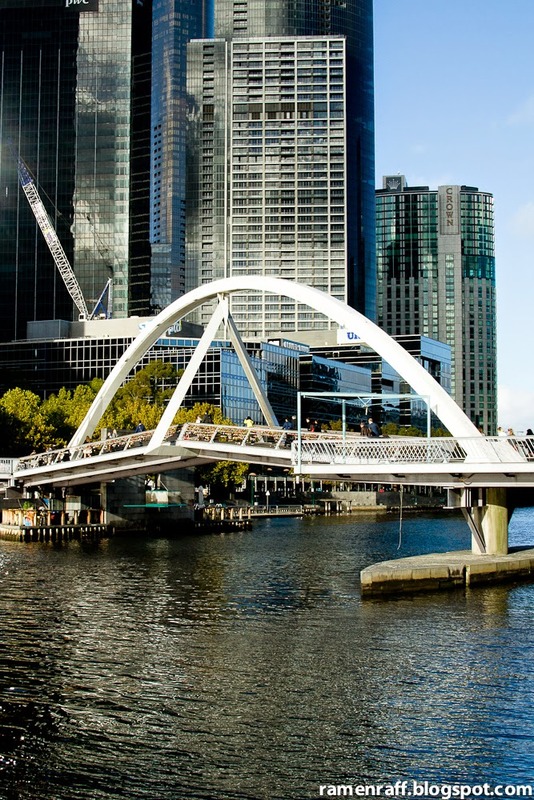 Arbory is located just behind Flinders Station on the Wharf by the Yarra river. 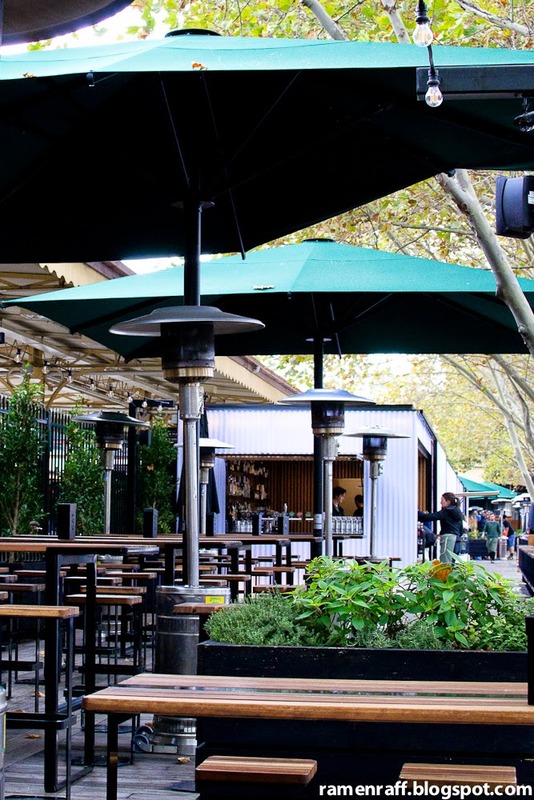 It is a super long contemporary bar and eatery on a deck with a space that serves as tranquil escape from the bustling Melbourne CBD during breakfast and lunch. 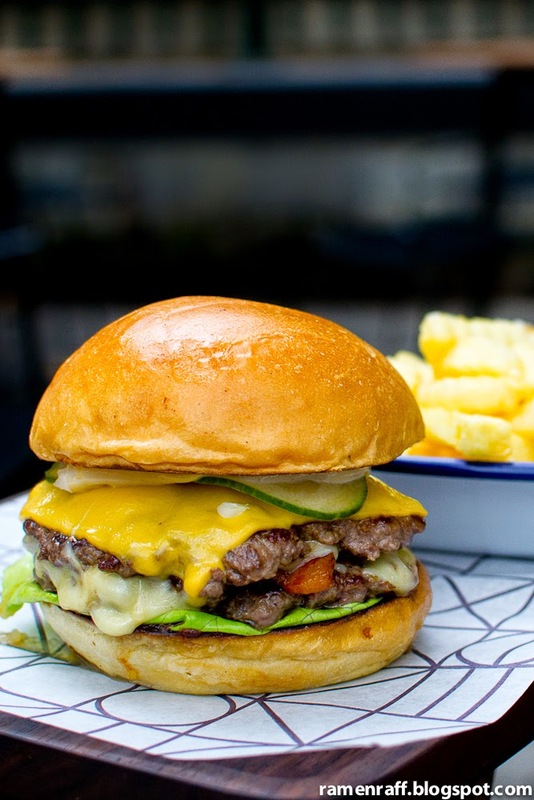 The main reason for this visit was to try their double cheeseburger with crinkled chips ($15). It had double smashed-patty, double cheese, bacon, pickles, tomato relish and lettuce in a soft sweet milk bun. I can confirm that the double cheeseburger here is amazing! The patties were flavoursome thanks to the caramelised crust and right amount of seasoning. 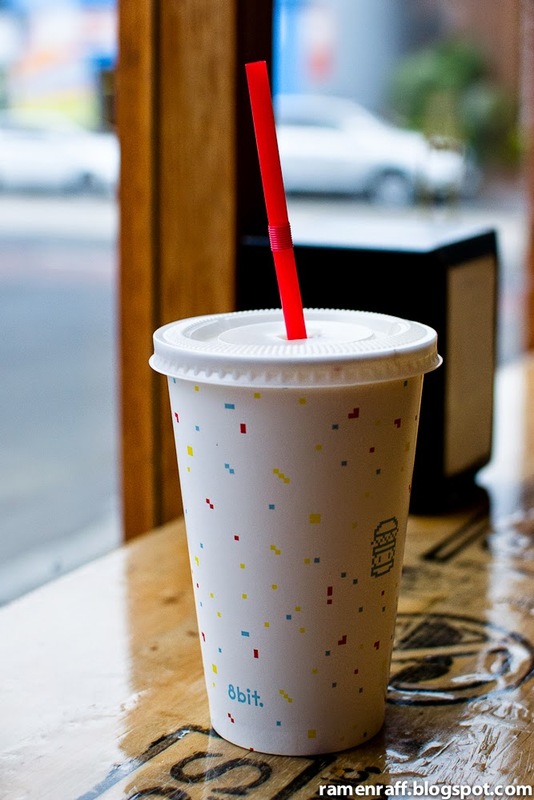 The sweetnesss from the relish and the sour pickles provided the tangy flavour that most cheeseburgers are known for. The cheese was nicely melted and the soft buns were lightly toasted which prevents the bun from getting soggy and it also adds extra flavour. Overall, it's a very well constructed burger. 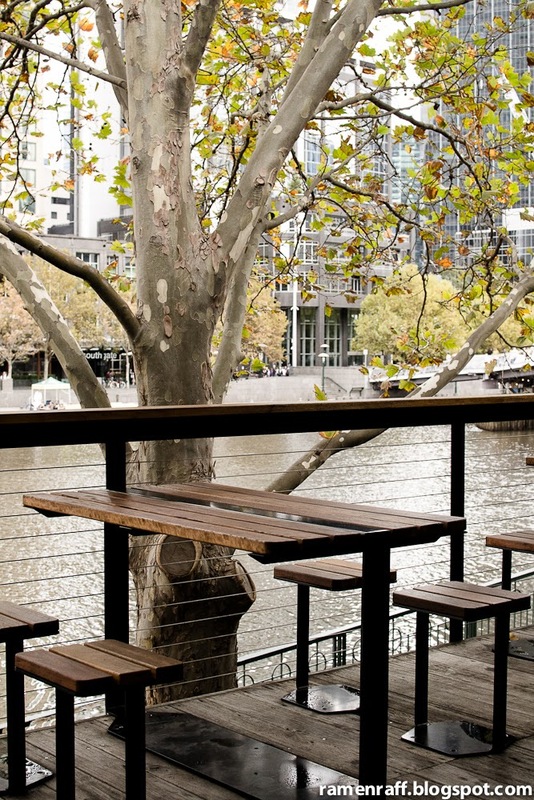 A burger of this calibre with perfect crisped crinkled chips and a fantastic view of the Yarra river makes this a bargain for its price. 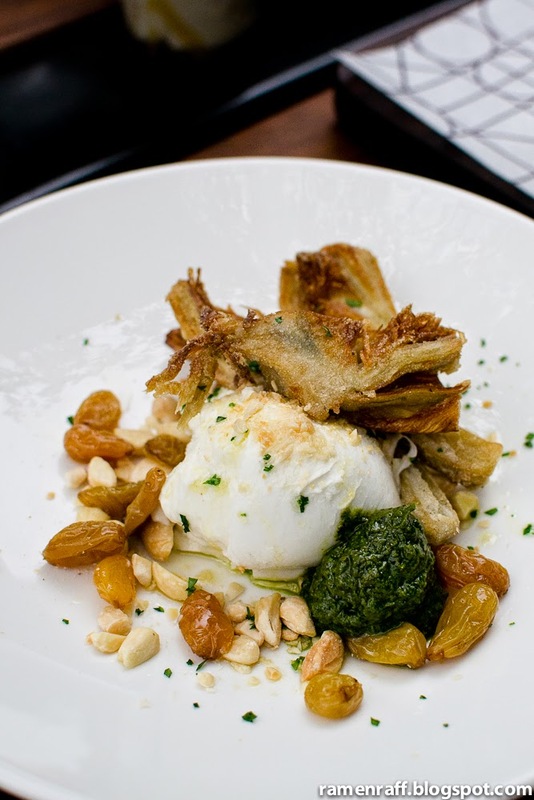 They also do an amazing buffalo mozzarella based dish with fried artichokes, green sauce, raisins and almonds ($16). The milky mozzarella worked so well with almond & raisins along with the parsely and mint green sauce. The fried artichokes had a nice crisped coating with tender and sweet flesh. This dish is all about getting delicate contrasting textures in harmony and taste great. 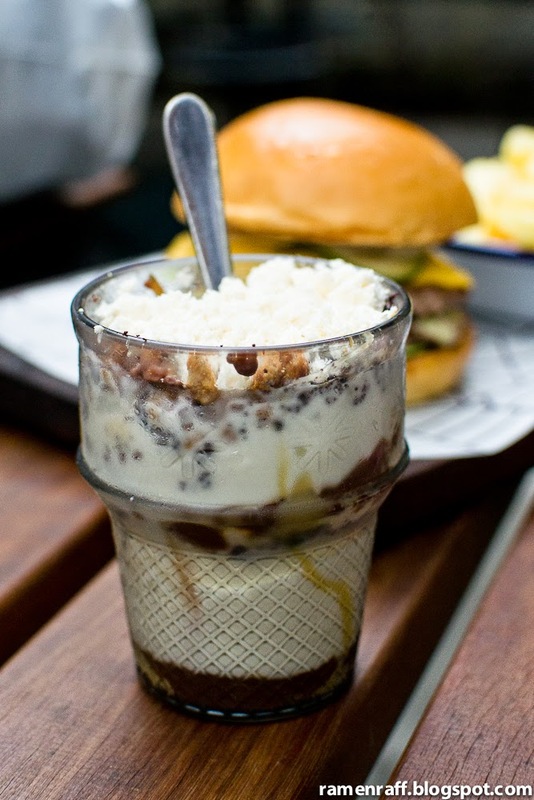 Another popular item at Arbory is their popcorn and salted caramel sundae ($10). It was absolute bliss. Ice cream with salted caramel, popcorn powder and popping candy. Need I say more? The name of this establishment alone should be more than enough to make me travel from the CBD to Collingwood. Everytime I see and hear the name Lazerpig, it reminds me of the Simpson's Spider-Pig song. 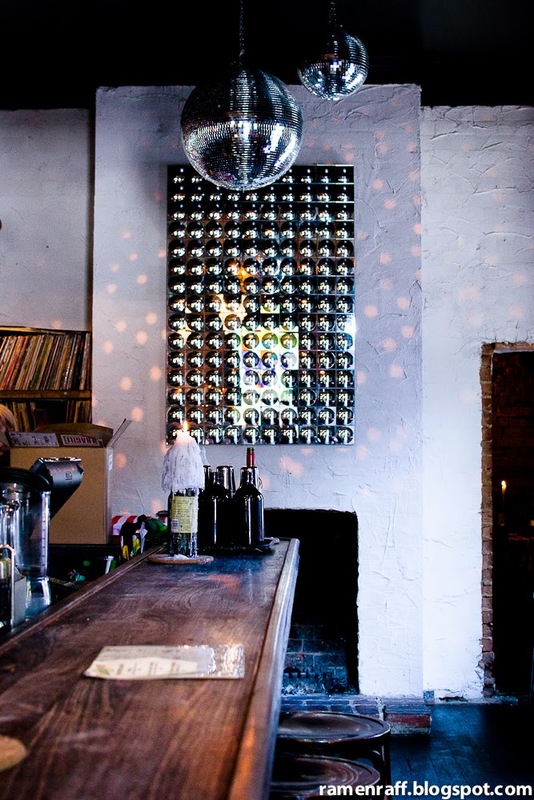 In my entire life, I have never come across such a space where pub meets Italian Trattoria with random disco balls and neon light signs. I loved it! 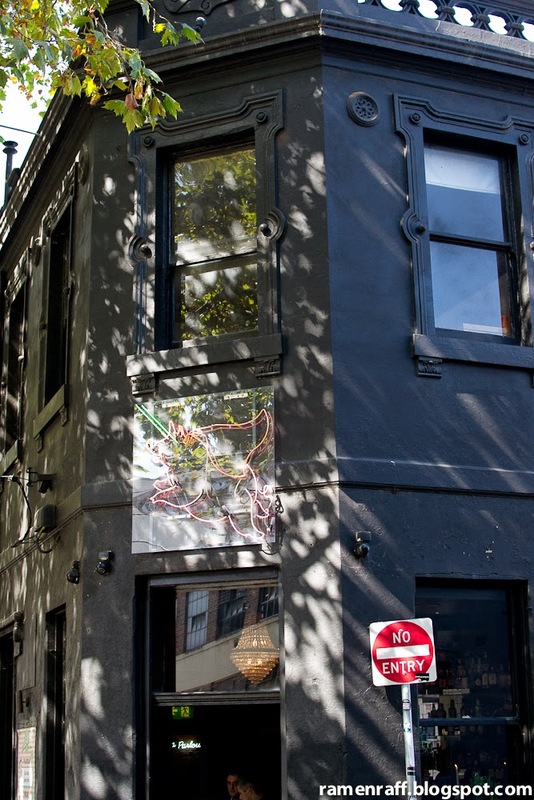 But not only did I love the restaurant space, name (best name ever! 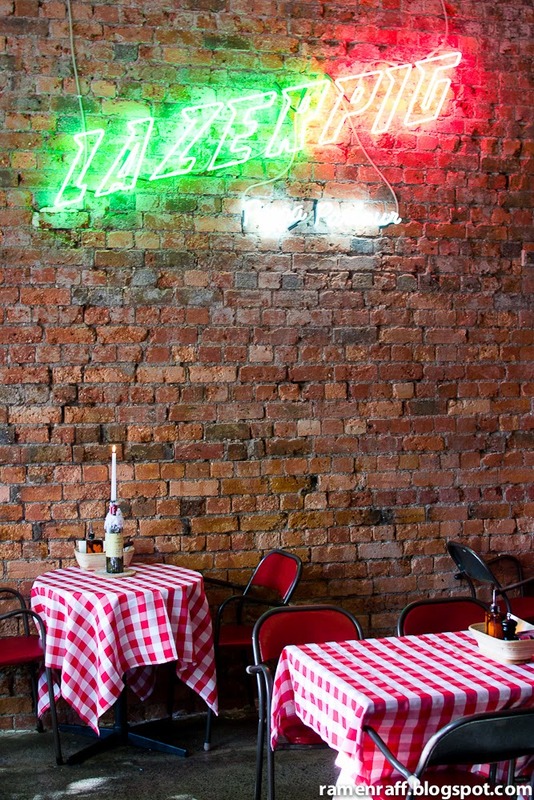 ), and service, they make a mean Margherita pizza and awesome cheeseburger! Ok, I'm normally strict with my cheeseburger rules where the only vegetables present should be onions and some sort of pickled vegetable like cucumber or gherkins. But Lazerpig's cheeseburger ($9 burger along and $11 with chips) with lettuce (can be easily discarded) is another exception. It had beef patty, melted cheese, onion, pickles, and a special sauce in a Breadtop-type soft sweet milk bun. 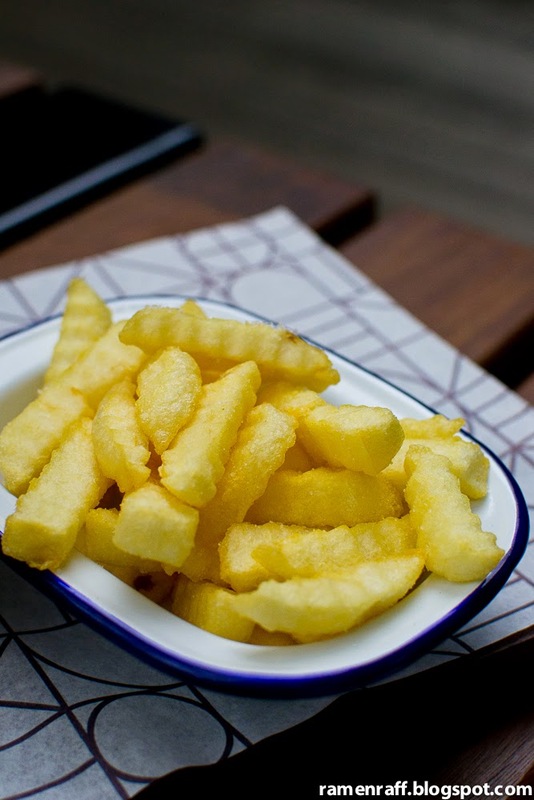 It is simple but superbly tasty! The patty is lightly packed and pan-grilled. It is one of the juiciest and most flavoursome patties I've come across. The burger handles well too. The Neopolitan style Queen Margherita pizza ($19) was delicious and was perfect for two people. But being the eating machine that I am, I could have easily devoured it on my own. It had the right amount of milky melted Buffalo mozzarella, the sauce had that nice tang, and the base was thin and soft with that legit woodfire burnt bits. 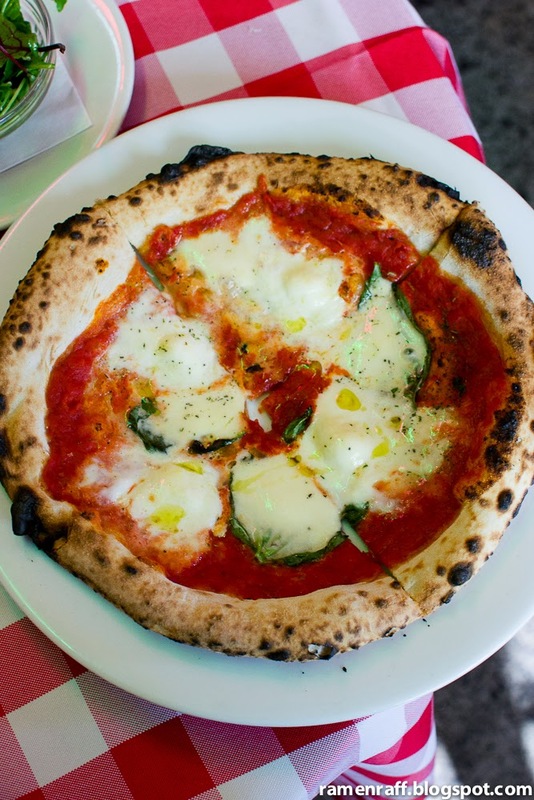 I just loved the perfection of its simplicity with just mozzarella, basil and tomato based pizza sauce in a perfect base. 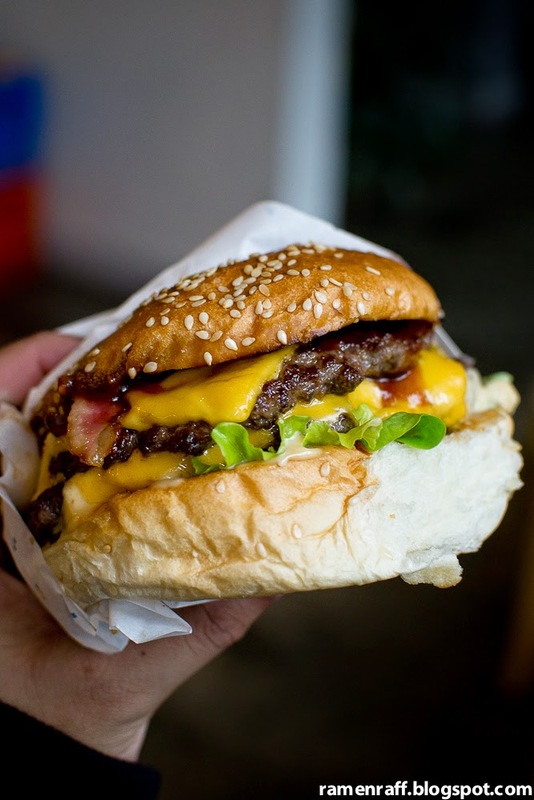 A Melbourne burger round up ain't complete without a visit to the almighty Huxtaburger! 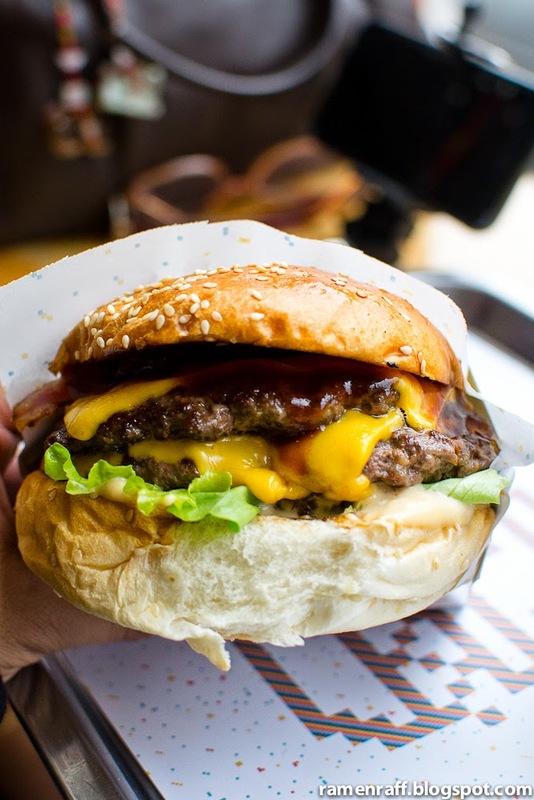 The huxtaburger ($9.50) is a classic burger with juicy beef pattie, melted cheese, mayo, tomato, lettuce, mustard and ketchup in a lightly toasted soft sweet milk bun. This burger never fails and always hits the spot! 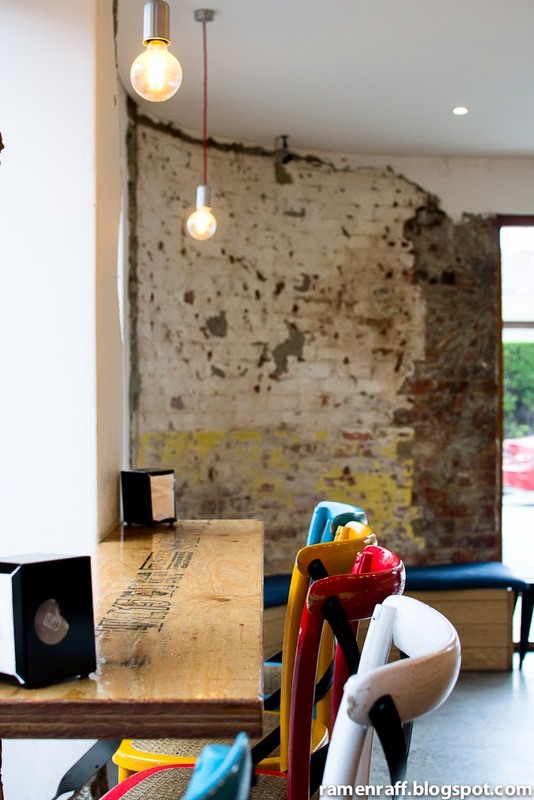 To say that "Melbourne's burger game is strong" is an understatement. It's a powerful force and an influential way of life. Never visit Melbourne without looking up and trying their burgers.